The RRR route on a Smartphone - for competitors! In 2012, I shepherded a late group from Maltby to the Finish in the dark. To my surprise, we were caught by a single walker. I enquired how he had managed to find his way in the dark. Had he recce'd the route? No, never done it before. He was following the route on his mobile phone (Android SmartPhone). He had uploaded the GPS route from this website, and using the MyTrails app was alerted of turns, and could follow the line of the route between waypoints. Extra essentials: Waterproof cover for phone, external battery, practice. Follow link to see detailed information. Other changes can be expected to be reported - please advise me of any changes to the route that you spot. The following links are planned to be updated prior to the event, when the route is finalised - see summary of changes below for updates in progress. at a Scale of 1:25000 with a lot more detail, including field boundaries. at Manvers Waterfront Boat Club, Station Road, Wath upon Dearne, Rotherham, S63 7DG. Start and Finish, showers & food at finish. Grid Ref SE 442017 Lat/Long N 53.51063 W -1.33582 For Sat Nav systems, use S63 7BU (the adjacent golf club) as S63 7DG may leave you south of Manvers Way instead of north of the roundabout towards Bolton. MWBC shares the track to golf club from Station Road. Alternatively park in the car park just before the pedestrian crossing with traffic lights 400 m further up Station Road, travelling towards Bolton. Walk to EC by crossing at PedX, follow path left, parallel to road, to track. MWBC is on the right. (From Bolton upon Dearne, cross river, then L after PedX for overflow CP, main CP/EC is 400 m further on to the right). Previous route as brown arrows, new start at red triangle (S of gate), following red arrows - red cross marks a narrow footbridge, best avoided. Finish at green concentric circles at end of green arrows (this is also the access route for vehicles). Small blue arrows show route from overflow car park, possibly a quieter spot for motorhomers! Car parking restrictions don't apply during the event, but do for recce runs. Navigation files (maps, description, GPS data, etc) await updating. To view the route, using Google Earth. b) Click on this link to the route file (or right click on this link, select 'Save Target As...' and save the file rrr_gps_map_trackpts_kml.kml to a suitable folder, e.g. My Places in My Documents, the default folder for Google Earth). NOTE: Save Target As... seems to think you want to save the file as type .XML - instead change type to 'All Files' at the bottom of the dialogue box. c) Open Google Earth and File Open the file you saved. You will see the route with start, checkpoints and finish. (start and finish are very close together to the north of the route; route is anti-clockwise) For clarity, it is best to switch roads OFF (untick box). d) When you exit Google Earth, decline the offer to save unsaved data, or you will get it in duplicate next time. The 2011 route file is available in three formats: path (showing waypoints), track, trackpoints for use with slider for preview (obviously not perfect real time) - also with 160+ waypoints (you may want to hide them). The route has been split into stages, so that you can 'tour' them at will rather than following the full route right through. Again, either click on the link or right-click and Save Target As... Again, the system seems to think you want to save the file as type .XML - instead change type to'All Files' at the bottom of the dialogue box. The display shows the GPS waypoints linked by straight lines and the actual / theoretical route as a bendy line. From Places on Sidebar (on left) and under Temporary places, and the name of the file, select Paths - Track (one for each of the 8 stages, in order). Sometimes the waypoints and path are not on the correct line, e.g. in a lake or, in one case, down the centre of a motorway - THIS IS NOT THE CORRECT ROUTE - take the appropriate path! (approximate) post codes for the checkpoints to assist SatNav users, checked against TomTom. We try to specify the route in advance, but late changes may have to be made, even on the day, if dictated by circumstances. 1. Waypoint markers Follow RRR markers, not to be confused with Rotherham Ring markers. Although markers have been put in place at many junctions, they are more valuable for confirming that you are on route than for navigating the route - if you are not on the look-out for a turn, you could well miss it. No new posts have been installed, so it has sometimes been difficult to put a marker in the most prominent location. We are also aware of markers having been moved or re-set pointing in the wrong direction. Thus the markers should be taken as secondary assistance to either the written description or Wainwright map. Receipt for confusion: The Rotherham Ring Route has recently been established, developed and waymarked. The publicity, by the local Ramblers Group, says is based on a route devised by RHAC, i.e. our Round Rotherham. The two routes coincide over much of the distance, but there are significant differences, notably near the middle checkpoint (we need to get to the Woodsetts check-point to give you refreshments) and near the start/finish. You won't come across a Ring marker before the approach to Elsecar. The two markers are shown here - at a point where the routes diverge. Both routes are waymarked - you just have to make sure you follow those with the 7-pointed start for Rowbotham's Round Rotherham. The Wainwright map generally indicates where the Ring Route markers may lead you astray by showing an open arrow with the legend 'Rotherham Ring' to one side or the other. The written description and strip map reflect local changes, e.g. displayed names on warehouses, local landscaping work, so need annual updating. 2. In the LDWA tradition, a Written description, or right click here and Save Target as ... or Print target (to print it properly) (updated for 2018). Alternatively available as a Word Document (use right click and Save Link) or webpage. The format has been revised in accordance with TRA guidelines and comments from users. Instructions are given to get from one decision point to the next, in a brief statement, with the distance (straight line) and direction (compass bearing(s)). A decision point is a junction or turn, i.e. where you have to decide where to go. The decision points correspond to GPS waypoints which are available on the GPS waypoint data page (See later). Thus, if you have a GPS (or Smartphone) loaded with appropriate GPS data, you can identify the waypoint you have reached and read the instruction as to how to proceed. Essentially, relocation has been made easy. See later. Be aware that the description is updated as necessary changes/corrections are identified up to the day of the event. IF YOU ARE NEW TO THIS TYPE OF EVENT, THE WAINWRIGHT MAP IS PROBABLY THE EASIEST TRADITIONAL NAVIGATION AID. Note: the scale is variable, depending on local detail. To give some indication of scale, the arrows are (approximately) 200 m long. Short arrows correspond to sections of simple navigation, following a canal (for example). Long arrows lead you through complex sections, with numerous twists and turns. GPS marker identifiers are shown in small yellow ovals to assist relocation (as described for 2. Written Description, above). Leading zeros are not used, i.e. the sequence is STA, A1, A2, .... My suggestion that the waypoint markers should also have these identifiers has not been supported. This schematic will be available (in colour) as hard copies on the day printed on waterproof paper - you don't need a map bag! (subject to availability). Be aware that the map is updated as necessary changes/corrections are identified up to the day of the event. Technical: The map was created using the Lotus Freelance software, now somewhat obsolete, but has now been converted to PowerPoint. In doing so, many tweaks and adjustments have been made, so that although basically the same, there are numerous differences. In particular, there is more consistency in symbols, e.g. line width, and more use of colour. You are recommended to use the new version of the strip map, preferably in colour. It is planed to have colour prints available on the day, some on waterproof paper (no need for a map bag), subject to availability. The maps are reproduced from Landranger� Map 111, 1:50000 scale and Explorer� Maps 278 and 279 1:25000 scale by permission of Ordnance Survey� on behalf of The Controller of Her Majesty�s Stationery Office. �Crown copyright 1974-2002. All rights reserved. Licence number 100047659. 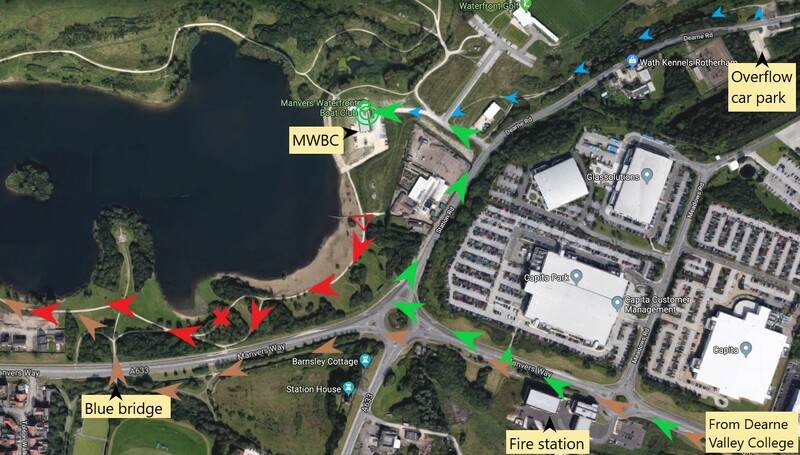 If you are driving round as a supporter, or fellow relay team member, the Route description (Supporter's cars) has postcodes for the event centre and all checkpoints, fairly routine for SatNavs. For competitors, there is also the possibility of using a car-type SatNav for navigation on the event. Follow this link for a detailed explanation (including comparison of trail and SatNav units). Keep an eye on this Navigation pages for more information. Obviously, the final GPS route files can only be supplied close to the day when the precise route has been finalised. As always, there are some uncertainties that need resolution. If you require a different GPS data format, contact me, Henry Marston (include a Subject and Body text - unexplained attachments may be treated as spam), and I will try to generate it for you (using GPSU). 10. The route in pictures. We are building up a set of pictures to show the route as you will see it. So far, we have the new access route from Rotherham, and sections where changes have been implemented (generally) These versions are not easily printed - I plan to create printable versions. Overall: a 50 mile / 81 km undulating mostly rural route, as measured by GPS. Yes, surprisingly to some, it's mostly rural. The longest urban section is where we get close to/make short visit to Sheffield. Overall climb is 800 m from a count of contour lines on maps, or 1230 m from the GPS track (maybe questionable). For this length of course, a Category C fell race under the aegis of the FRA would have to provide over 1500 m of climb, or 3800 m for category A, so I'm afraid it's not hilly enough for some! For 2 person relays, the odd stage runner gets the 3 long stages, 1, 3 and 7 (total 47.8 km, c.f. 33.2) with most climb. Stage 1 (15.7 km) has hard-surfaced paths, road and canal towpath, unfortunately made good so that there is little risk of sliding into the canal, to a yard and then somewhat muddy (briefly) through a wood. Track, road (minor) path through a village, then we have found a muddy ridge. Then firm. This is the stage with most climb and descent - slightly undulating to Elsecar, but then climbs and drops through Kings Wood, Wentworth, Thorpe Hesley and up to Keppel's Column before descending to the CP. Stage 2 (10.1 km) is mostly firm (the main excitement, when leaving Grange Park, is now bypassed). Tracks and road, the urban section through Sheffield (Tinsley). Drop from CP to stream, up and over a ridge to the River Don, then undulating to the CPjust above the Rother. Stage 7 (11.2 km) starts with road run through Maltby, to a field-side track that can be wet. Short firm section of road, through village of Micklebring, then 3 km of (sometimes) well-defined field paths - depending on ploughing - to a track through a hamlet. The field path after and the path through the wood can be wet, the latter being (steeply) downhill so let yourself go - or take it with care, especially after dark. After the road crossing it's gently uphill on a road that deteriorates to a muddy track, but down a firm field to the checkpoint. If you leave Maltby after 17:00, you will need a torch/headlight on this section. Undulating, the longest climbs being after Firsby and after Hooton Roberts. Stage 8 (7.4 km) used to be tricky, but has been subjected to council interference replacing muddy paths with cycleable routes. A lit cycle track replaces a path slipping into the mire. Mud is at worst only a few millimetres deep with a firm base. Path, towpath, track and road. Gentle slopes. There is a possible access problem in the section between Grange Park and Tinsley. From the Park, we drop down a steep slope, cross a stream and climb to Droppingwell Lane . Crossing this, we continue to climb a track to a stile where we turn right to Hilltop (Kimberworth). We cross a road and drop along a fence to a pylon where we turn left and drop onto Meadowhall Road . The problem is in the next short section, along a track to a stile on the right from which there is a short of footpath leading to Meadow Bank Road , which we follow before dropping down to a footbridge over the railway before dropping to the river. Just before the 2007 event, it was found that a gate had been installed across the Meadowhall Road end of the track, obstructing access to the track, stile and path. A new house had been built in a compound at the end of the track, after the stile where there are now gateposts (no gate) across the track. A remnant post next to these new gateposts still has one of our original metal >-RRR-> markers on it. Rotherham Metro Ramblers reported the obstruction of the path to the Rotherham Rights of Way Dept who have taken some action by clearing the path and writing to the land owner. This is an important linking section that has been part of the Round Rotherham route since it was first devised. In the past, it was across derelict land, with free access. Now that the house has been built, it would help safeguard the route if this section was established as a Right of Way. For the 2007 event, the new gate was left open for the event. In 2008, it had not been opened; I think most people climbed it. Clearly, this is not ideal; a diversion route was specified. The public enquiry agreed to dedication of the ROW subject to amendment. The report was written in November 2011, so the diverted route was used in 2011. It was reopened as a public path (ROW) on 2 May 2013, in good time for the 2013 event and recce runs.